With a history of more than 83 years, McBryde Oil Company is a trusted leader in wholesale fuel in the Texas Hill Country. We have established a solid reputation in our community for delivering reliable products, competitive pricing and outstanding customer service. 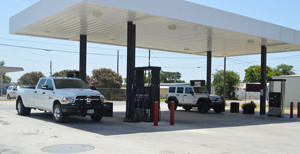 We sell and deliver gas, diesel and kerosene to businesses and residents throughout Central Texas. We offer branded and unbranded fuels to a large number of retail businesses, including convenience stores, truck stops, grocery fueling stations and more. Every year, we deliver over 1 million gallons of fuel via our fleet of tankers to over 500 customers within 75 miles of Kerrville, Texas. Our gas and diesel pumps from our main location and Segovia location are open 24/7 for your convenience. No matter your business, McBryde Oil Company can create a comprehensive fuel supply program tailored to your specific business needs. Contact us today at (830) 257-6577 and see why we are one of the premier fuel suppliers in Kerrville, Boerne, Fredericksburg, Junction, Bandera, and beyond.